The active and effective management of valuable knowledge is widely believed to be a core competency for solidifying the competitive advantage of an organization. 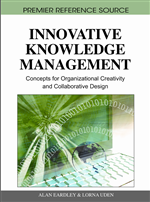 Whether knowledge management (KM) is a new idea or just a recycled concept per se both managerial and academic campuses have sought a vast array of KM strategies, solutions, frameworks, processes, barriers and enablers, IT tools and measurements over the past decade. Although there are many KM studies for both public and private sectors, most of them focus on the practice of international companies and western experiences, relatively few cases are reported on KM deployment and implementation in the Chinese community, especially for knowledge intensive research and development (R&D) institutes whose missions are to serve traditional industries. To reveal some of the accomplishments gained in the Asia-Pacific region, this chapter presents and discusses the lessons learned from a particular case study in fostering the KM initiative and system in a research-oriented institute serving the metal industry. R&D plays a fundamental role in the competitiveness of technological innovation. These R&D processes can primarily be seen as information transformation processes, transforming information about client orders, market demand and technological advancement into product and process designs (Drongelen et al., 1996). In the case of R&D organizations, knowledge workers synthesize tangible and intangible resources to create value-added knowledge-based products as their major outputs. These knowledge assets are indexed in terms of consultancy, innovative products, expert reports, and intellectual properties. The majority of professional knowledge and expertise frequently originates in the context and activity of research projects and industrial services implementations. In a project-based engineering firm, there are three main aspects of knowledge: technical, entrepreneurial and project management knowledge (van Donk & Riezebos, 2005). From another point of view, types of project knowledge can be viewed as: knowledge about projects, in projects and from projects (Damm & Schindler, 2002). Knowledge for R&D work exists in various forms and sources as indicated in Table 1. The ability to manipulate R&D knowledge highly depends on the type of knowledge source and form. For instance, internal-explicit knowledge is easy to collect and manage, while external-tacit knowledge requires a lot of efforts to acquire and maintain. Accordingly, when an organization wishes to incorporate KM, the first step is to implement knowledge audit to identify the sources of R&D knowledge and decide the management priority.